When King David heard of all these things, he became very angry, but he would not punish his son Amnon, because he loved him, for he was his firstborn. David was a great warrior, a great general, and a great leader of men. Evidence leads me to believe that he was not, however, a great husband or father. As we’ve read David’s story he has slowly been amassing wives like the spoils of war and the result was many children. But, an army of children do not an army make. A family system and the complex relationships between birth order and gender can be difficult enough for a monogamous, nuclear family. I can’t imagine the exponential complexities that emerge when you have eight wives, ten concubines and children with most all of them. As I read through these chapters I’ve noticed that we never see David telling his children “no” nor do we see him discipline them for their behavior. David appears to have even had a reputation among his offspring of not refusing their requests. David’s daughter, Tamar, tells her half brother Amnon that if he simply asks Dad she’s sure he’ll let them get married. When Amnon rapes Tamar instead and then turns her away we hear of David’s anger, but he doesn’t do anything about disciplining his beloved first born son. When Tamar’s full brother Absalom plots to kill their half brother Amnon in revenge, Absalom goes to David and presses good ol’ dad until David relents and sends all the brothers on Absalom’s little fratricidal sheep-shearing retreat. David has a blind spot. He can lead an army to endless victories but his record as leader of a family is a tragic string of failures and defeats. I cannot point at David without three fingers pointing back at me. We all have our blind spots. Our greatest strengths have their corollary weaknesses. We cannot escape this reality, but we can escape being enslaved to it. What we can do is be honest about our blind spots. We can choose to shine a light of our time and attention to addressing them. We can surround ourselves with others who will graciously help us see them, work through them, and who will patiently love us as we do. Today’s chapter seems perfectly timed as I’ve been made painfully aware of a blind spot in my life. If you’re reading this, and are a person who prays, please say a prayer for me as I address it. 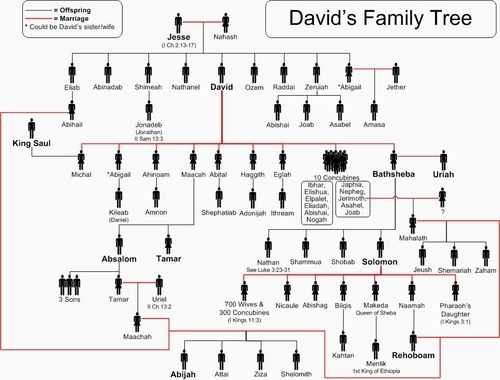 King David – A Great King, but With a Critical Flaw That is all too common today. The chapter today reminds me of human frailty. Our human sinful tendencies are strong, and if we give in to them, people get hurt. Today’s example of Amnon’s sexual desire is a big one, but our human competitive nature, gossip nature, etc can be equally damaging. I am reminded today when thoughts pop into my head, to pause and think about them rather than immediately acting on them.